Heldenplatz (Heroes' Square) in Vienna with the statue of Archduke Charles of Austria in front of Hofburg Palace, Charles was Austria's main military leader who fought against France during the Napoleonic Wars. Austrian nationalism is the nationalism that asserts that Austrians are a nation and promotes the cultural unity of Austrians. Austrian nationalism originally developed as a cultural nationalism that emphasized a Catholic religious identity. This in turn led to its opposition to unification with Protestant-majority Germany, something that was perceived as a potential threat to the Catholic core of Austrian national identity. Austrian nationalism first arose during the Napoleonic Wars, with Joseph von Hormayr as a prominent Austrian nationalist political leader at the time. In the 1930s the Fatherland Front government of Engelbert Dollfuss and Kurt Schuschnigg rejected current pan-German aspirations to join Austria with a Protestant-dominated Germany, whilst not wholly rejecting a potential union and claiming that any unification of Austria with Germany would require a federal German state where Austria and Austrians were guaranteed privileged status recognizing an Austrian nation within a German Kulturnation. Following the events of World War II and Nazism, Austrians began to reject the German identity, and a broader Austrian identity replaced it. After the war, there were those who went as far as describing Austria as "Hitler's first victim". In the post-World War II period proponents who recognize an Austrian nation have rejected a German identity of Austrians and have emphasized the non-German heritage among the Austrian population including Celtic, Illyrian, Roman, and Slavic. Proponents who recognize Austrians as a nation claim that Austrians have Celtic heritage, as Austria is the location of the first characteristically Celtic culture (Halstatt culture) to exist. Contemporary Austrians express pride in having Celtic heritage and Austria possesses one of the largest collections of Celtic artifacts in Europe. Austrian nationalism has been challenged internally. The main rival nationalism has been German nationalism. Another rival nationalism emerged after the defeat of Austria-Hungary in World War I, Bavarian nationalism which challenged the new Austrian Republic with proposals for Austria to join Bavaria. At this time the Bavarian government held particular interest in incorporating the regions of North Tyrol and Upper Austria into Bavaria. This was a serious issue in the aftermath of World War I with significant numbers of Austria's North Tyrolese declaring their intention to have North Tyrol join Bavaria. Josef von Hormayr, the prominent Austrian nationalist political leader during the Napoleonic Wars. Rally of the Fatherland's Front in 1936. The Napoleonic Wars were the cause of the final dissolution of the Holy Roman Empire of the German nation, and ultimately the cause for the quest for a German nation state in 19th-century German nationalism. German nationalism began to rise rapidly within the German Confederation, in 1866 the feud between the two most powerful German states Austria and Prussia finally came to a head in the German war in 1866. The Austrians favoured the Greater Germany unification but were not willing to give up any of the non-German-speaking land inside of the Austrian Empire and take second place to Prussia. The Prussians however wanted to unify Germany as Little Germany primarily by the Kingdom of Prussia, whilst excluding Austria. In the final battle of the German war (Battle of Königgrätz) the Prussians successfully defeated the Austrians and succeeded in creating the North German Confederation. In 1871, Germany was unified as a nation-state as the German Empire that was Prussian-led and without Austria. Nevertheless, the integration of the Austrians remained a strong desire for many people of both Austria and Germany, especially among the liberals, the social democrats and also the Catholics who were a minority within the Protestant Germany. The idea of uniting all ethnic Germans into one state began to be challenged with the rise of Austrian nationalism within the Christian Social Party that identified Austrians on the basis of their predominantly Catholic religious identity as opposed to the predominantly Protestant religious identity of the Prussians. Following the end of World War I with the rump state of German-Austria, many Austrians desired that Austria be united with Germany. Better than 90% of interbellum Austrians identified as Catholic. 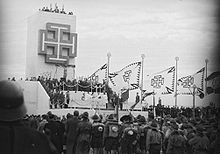 With the rise of Engelbert Dollfuss to power in Austria in 1932 and the creation of the Fatherland's Front, the Dolfuss government promoted Austrian nationalism and claimed that Catholic Austria would not accept joining a Protestant Germany or "heathen" Nazi-led Germany. Dollfuss accepted that Austrians were Germans but rejected the idea of Catholic Austrians submitting themselves to be taken over by a Protestant-dominated Germany, and instead claimed that Austria needed to revive itself and recognize the greatness of its history such as its Habsburg dynasty having been the leading part of the German Holy Roman Empire, and that when Austria restored itself, it would found a federal state of Germany that would recognize Germany as a Kulturnation, but would also recognize Austria as having a privileged place within such a federal state and the existence of an Austrian nation within the German Kulturnation. The Dollfuss/Schnuschnigg government did not deny that Austrians were Germans but opposed annexation into Germany especially under the Nazi regime. An independent survey conducted in early 1938 revealed that 60 percent of Austrians at that time favoured union with Germany, while 40 percent were opposed, later upon German troops entering Austria, the Nazis forced the issue of annexation in a referendum in which under Nazi supervision 99 percent of the Austrian (excluding non-Aryans) voters in the referendum voted in favour of annexation of Austria to Germany, the Anschluss was met with a huge welcome from the Austrian Germans. The relationship between Austrian Catholicism, national identity, and fascism has been a source of controversy. After the fall of Nazi Germany and the events from this and World War II, Austrians began to develop a more distinct national identity. Unlike earlier in the 20th century, in 1987 only 6 percent of the Austrians identified themselves as "Germans". In 2008, over 90 percent of the Austrians saw themselves as an independent nation. ^ a b Motyl 2001, pp. 31-32. ^ Owen Connelly. The French revolution and Napoleonic era. Harcourt College Publishers, 1999. Pp. 254. ^ a b c Discursive Construction of National Identity. P. 52. ^ Motyl 2001, p. 32. ^ Bruckmüller 1993, pp. 198–9. ^ Carl Waldman, Catherine Mason. Encyclopedia of European Peoples. Infobase Publishing, 2006. P. 42. ^ Suda Lorena Bane, Ralph Haswell Lutz. Organization of American Relief in Europe, 1918-1919: Including Negotiations Leading Up to the Establishment of the Office of Director General of Relief at Paris by the Allied and Associated Powers. Stanford University Press, 1943. P. 119. ^ Macartney 1926, p. 112. ^ Carsten 1986, p. 3. ^ Diamant 1957, p. 603. ^ Bijman 2009, pp. 7–8. Beniston, Judith (2003). " 'Hitler's First Victim'? — Memory and Representation in Post-War Austria: Introduction". Austrian Studies. 11: 1–13. JSTOR 27944673. Bijman, R. C. (2009). Clerical Fascism? : A Controversial Concept and its Use (PDF). MA thesis. Utrecht: Utrecht University. Bruckmüller, Ernst (1993). "The national identity of the Austrians". In Mikuláš Teich and Roy Porter, eds., The National Question in Europe in Historical Context (pp. 196–227). Cambridge: Cambridge University Press. ISBN 978-0-521-36441-6. Carsten, F. L. (1986). The First Austrian Republic, 1918–1938: A Study Based on British and Austrian Documents. Aldershot: Gower. ISBN 978-0-566-05162-3. Diamant, Alfred (1957). "Austrian Catholics and the First Republic, 1918–1934: A Study in Anti-Democratic Thought". The Western Political Quarterly. 10 (3): 603–633. JSTOR 443538. Macartney, C. A. (1926). The Social Revolution in Austria. Cambridge: Cambridge University Press. Wodak, Ruth; de Cilia, Rudolf; Reisigl, Martin; Liebhart, Karin (2009). The Discursive Construction of National Identity (Second ed.). Edinburgh: Edinburgh University Press. ISBN 978-0-7486-3726-3.